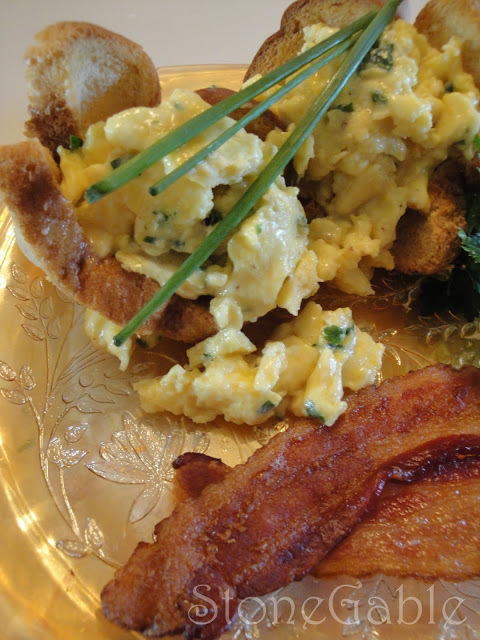 I served delicious eggs laced with fresh herbs and cheese in crispy toast cups. Preheat oven 350 degrees. Butter white bread. 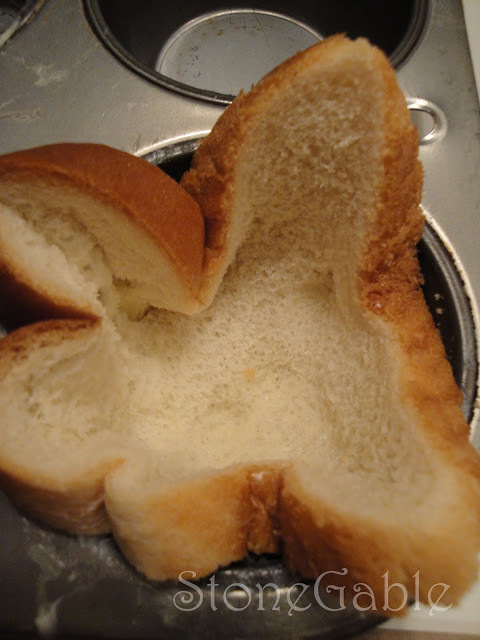 I call this kind of bread “bunny bread”. Press bread, butter side down, into the cups of a muffin pan. 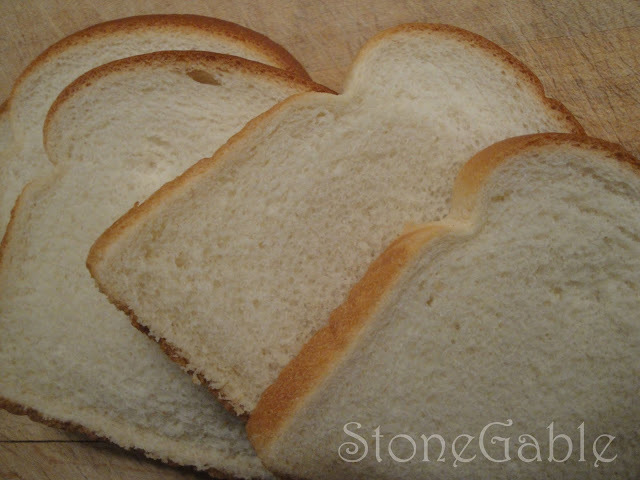 Make sure the crust of the bread is arranged in an open position . Bake cups in oven for 20 minutes. Remove cups from muffin pan. Set aside. 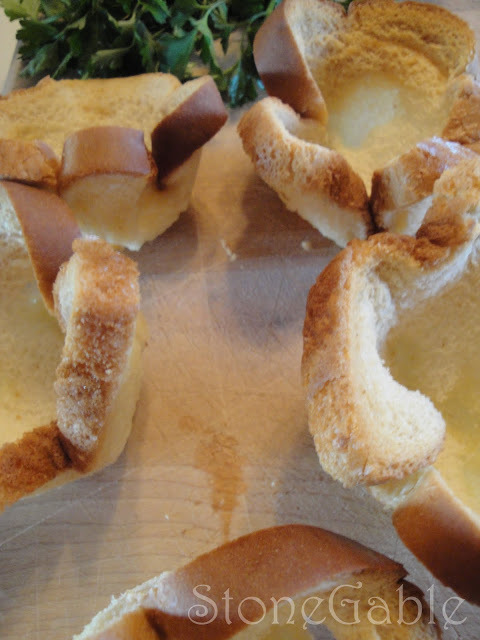 Toast cups will be slightly browned and very crisp. Cups can be made a day ahead and re-warmed. Break eggs into a large bowl. Add egg beaters and milk. Add a pinch of salt and pepper. Whisk vigorously until smooth amd full of air. Heat butter in a large skillet. Watch it carefully so it does not burn. Add eggs and keep stirring. You want them to scramble and not solidify like an omlet. When eggs are developing into small clumps and there is no liquid eggs in the pan, gently stir in fesh herbs and cheese. Keep on heat just until grated cheese is melted. Plate toat cups, and over fill with eggs. Let the eggs spill over the cups onto the plate. Top with fresh herbs. I am joining Foodie Friday, hosted my Michael Lee, at Designs By Gollum. ~Yvonne I dont’t know if you ever post your dishes (recpies and tablesettings) on Foodie Friday but you really should, I shared your link for this when I post my tonight. Click below and take a look. Thank you for brightening my world by sharing yours. I have brunch for my husbands family the second Sunday of every month and love new ideas, thank you for sharing this technique. I love it! This recipe sounds really good and it is easy. I see you have carnival glass dishes. I love this glass (along with pink and green depression glass, LOL). This looks delicious! And what a pretty table to enjoy such a wonderful dish on. Thanks for sharing. Hi Yvonne~ ~Such a lovely presentation of your egg dish. I’m sure your friend felt the love you put into the meal. Enjoy your weekend. 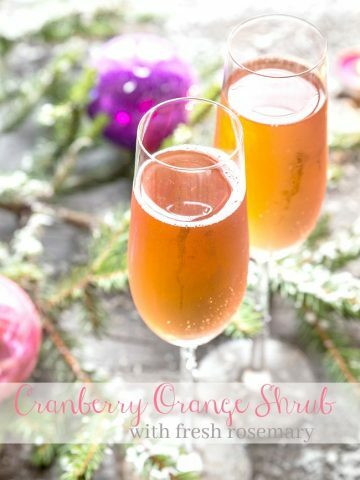 What a darling idea for brunch. Your table is breathtaking, a feast for the eyes. Thank you so much for sharing your artful ideas at Foodie Friday. Oooo. 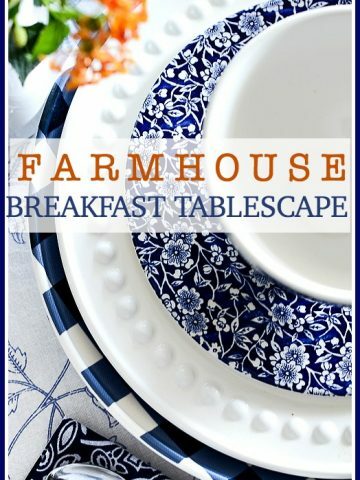 I want to come to breakfast at your house! I just love breakfast food any time of the day or night! lol These toast cups are a wonderful idea! I’ve never seen scrambled eggs look so delicious in a photo! Beautiful pictures! Makes me hungry just to see them. I love the toast cups! Just want you to know that after reading your post and seeing your delicious pictures I had to go straight into my kitchen and whip up some eggs and herbs! I would love to have eaten it in your beautiful setting though. Thanks for the recipe, inspiration and lovely pictures! Happy day! your friend is lucky to have you. This looks terrific. 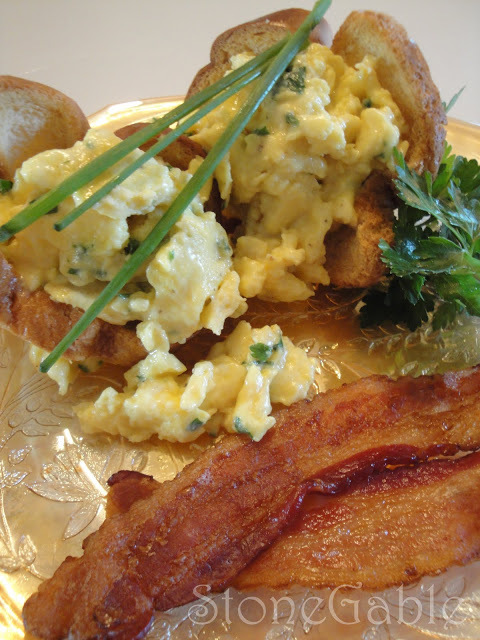 When my kiddos were small we used to cut up toast and then scramble it in the eggs….we called it Egg Toast. They loved it and this looks like a very grown-up version. YUM!! I’m sure your friend felt very special sharing this meal at your lovely sunny table. Goody! I was so hoping that you would do a tutorial on these. They just looked so fantastic! Maybe it was the china too. These would be so great to serve for a spring luncheon. Do you know that I have gained 5 pounds since finding your blog? Oh well, more of me to love right?! Yum, Yum….I was hungry when I woke up…Now I’m going to cook instead of having something fast! You’ve inspired me…and I’m starving! Thanks for visiting my blog, yours is beautiful! I will definitely be back! What a wonderful looking breakfast, and the toast cups are oh so very clever! Thank you for stopping by to visit. I would like to come dine with you…the food looks delicious and it is so beautifully presented. I have the same dish pattern and napkin rings…but they look prettier on your table! LOL! Everything looks perfect ~ wonderful photos, too! Oh, this looks great! 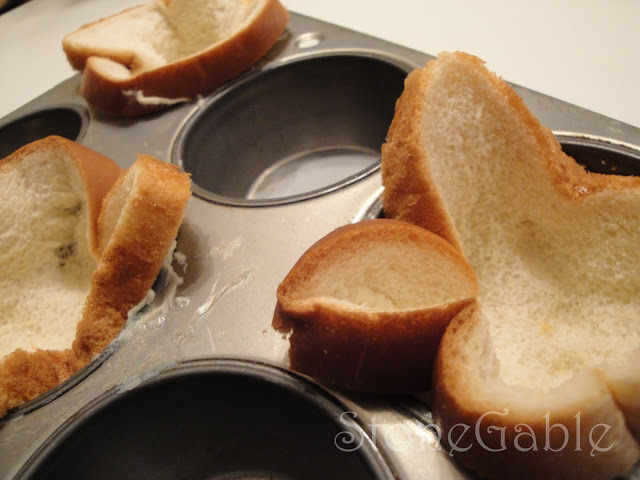 The toast cups are such a smart idea. Beautiful presentation! 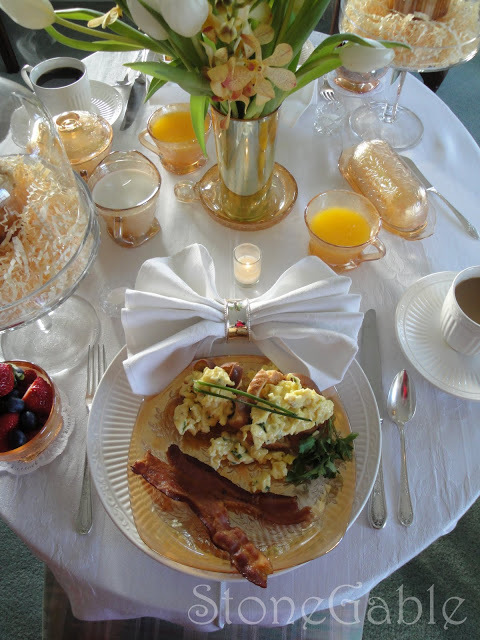 I love breakfast but rarely share it with company – only at Christmas. This would be the perfect treat for me. My favorite meal is breakfast if I am not the one who cooks it! Sound delicious and the pictures are great! 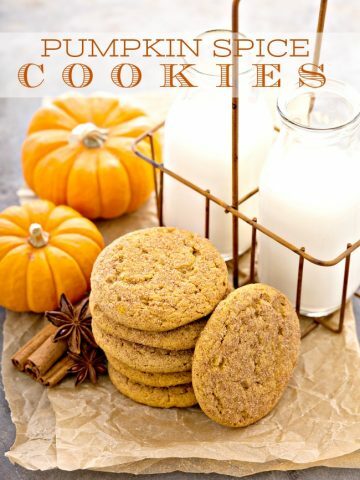 Thanks so much for the recipe…when I saw these on your TT post, I knew that I was going to have to try them. They are so great looking and I can’t wait to try them this weekend. Happy cooking!! Yvonne, these look SO good! May I come stay at your house and eat these wonderful eggs, too??? Oh, YUM! First of all, I adore scrambled eggs. Secondly, I love chives. Now, I am starving! LOL! But I need to blog first. That sounds yummy and easy and delicious. Great combination! O.MY.GOSH. !! This looks absolutely delicious. And so pretty, too. 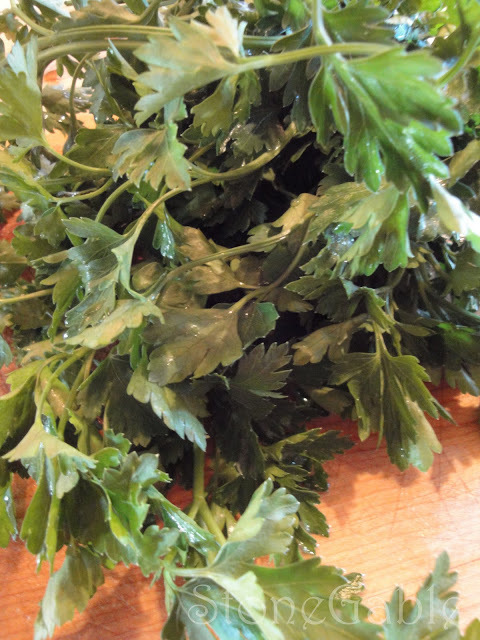 I just happen to have every thing on hand EXCEPT the fresh herbs. 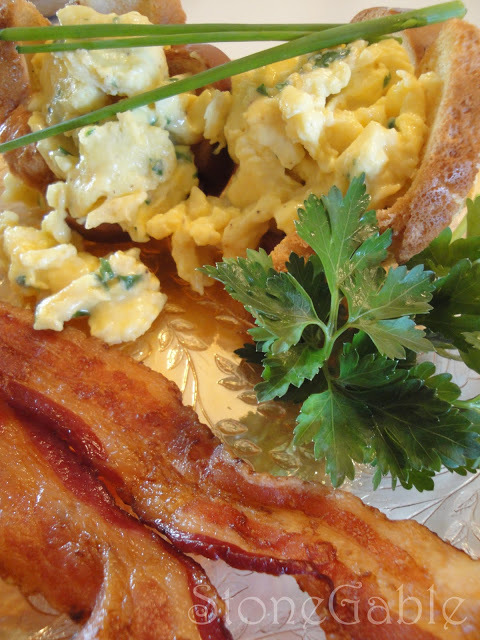 I want to make this for my hubby in the morning so I will try it with dried spices. Then, when I go to the groc. store, I’ll get the fresh herbs. We have so much snow and ice, it will be awhile before I go. Oh, my….I LOVE the sound of these egg cups. Thanks so much for sharing the recipe. These look yummy! And the toast cups how clever! Brunch is one of my favorite ways to share a meal with a friend! 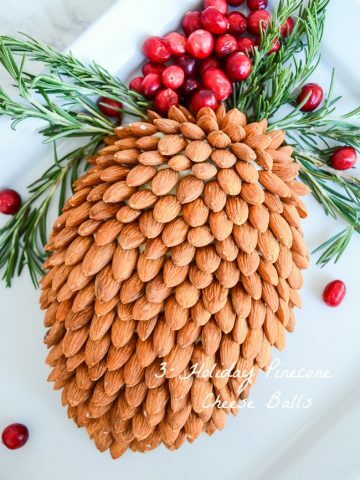 This looks wonderful, Yvonne- a pretty presentation and simple enough to prepare quickly. Excellent!